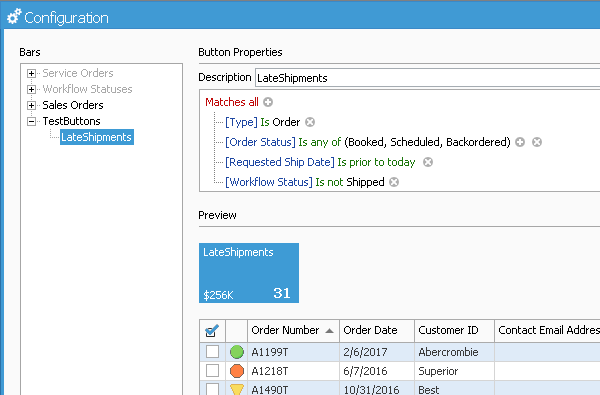 The Order Manager can quickly offer users for displaying a list of scheduled orders in which the Requested Ship Date is prior to today’s date and the Workflow Status is not equal to “Shipped”. First, in order to create or modify a button in the Order Manager, you need to start by creating a new Order Manager Bar. Refer to this article on creating a custom bar in the Order Manager. Once you have created your custom bar, you can select to modify or add a new button to your custom bar. In the example, below, I have added a new button called “LateShipments” in the TestButtons custom bar. Notice the following conditions, specifically, the Requested Ship Date and the Workflow Status. Of course, you can add additional conditions to this button if you prefer to filter the list of orders further.